Important Note: If you use a SuperWidget addon and you have embedded your calendar on external website, it is necessary to activate “Accept Frontend Submissions from Super Widget” option. Navigate to your calendar’s page and look for the green “Post Your Event” option on the top right corner of the calendar. Fill out the necessary details of your event then “submit event” for approval. Remember, If you are logged into an account that has permission to post an event on the calendar, your event will be posted automatically. If you do not have permission from the admin (ie, your site visitors), your event will be sent to drafts pending approval. To review which roles have permission to post events on your calendar, click here. Next navigate to Google’s Key Creation tool. Enter your domain name and select “Create Key”. Copy and paste both the public and private key back into the appropriate Timely fields. Select “update settings” at the bottom of the page when you are finished. Note: Only anonymous users will be asked to fill out the captcha. WP users who have been assigned a role will not be asked. I am the admin – how do I know when someone submits an event? When you are in your dashboard, click on Events. There will be a number beside “All Events” that indicates how many events are pending approval. 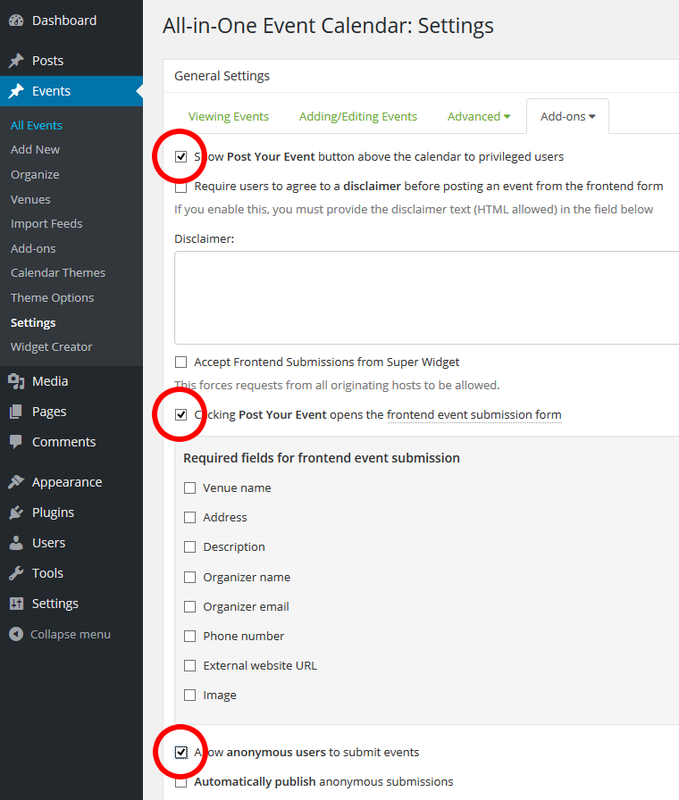 People submitting events will get an auto-message both after they submit an events AND when the event goes from pending to published. You can change the auto messages they receive in the bottom two boxes. Customize this message to further promote your site or additional services you offer. Using the shortcode [ai1ec_interactive_frontend] you can place the button that opens the form on any page.